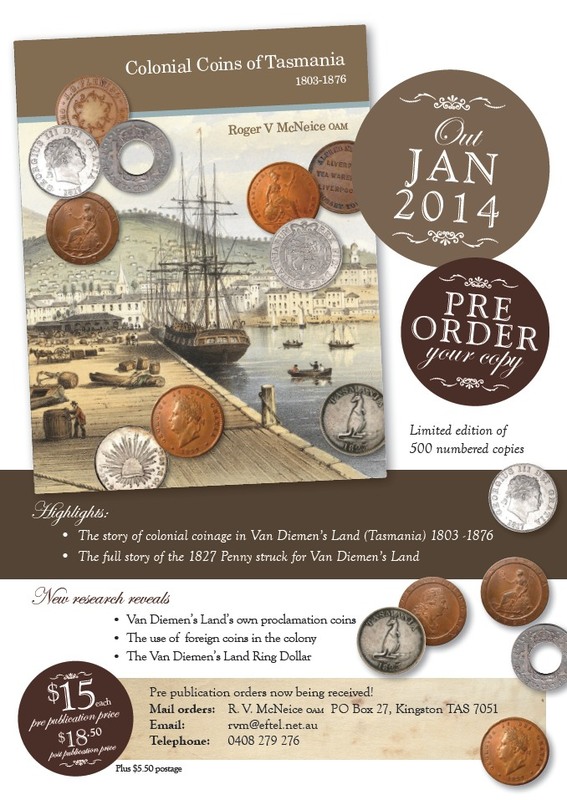 Roger McNeice, a well known Tasmanian numismatist is releasing a new book on Tasmanian colonial coins entitled "Colonial Coins of Tasmania". It's available at pre-release pricing of $15 a copy direct from the author (rvm@eftel.net.au). If you're interested in colonial or proclamation coins then this would be a great addition to your library. In my previous entry about Australian proclamation coins I mentioned the Gold Ducat of the Netherlands which was valued at 9 shillings and sixpence in the proclamation. A small 21.8mm coin minted from about 3.49g of 0.986 fine gold you can see an example of the 1776 proclamation ducat above. Ducats were an international trade coin of Europe that were first minted in Venice in the 13th century and first minted by the Dutch in 1589. Several European countries still mint ducats of the same size and gold content as have been minted for 500 years or more. The Dutch ducat is likely to have been named specifically by Governor King in the Proclamation of 1800 because of the proximity of the Dutch East Indies (now Indonesia) and the Dutch influence over the areas controlled by the British East India Company (such as in India and Ceylon). Because of these factors the Dutch ducat was likely to have been seen in some numbers in the new Colony of New South Wales. The obverse depicts a knight facing right holding a bundle of arrows that symbolise the provinces of the Netherlands. The legend shows the mint (in the example above Holland), the year of issue, and the Latin motto CONCORDIA.RES PAR.CRES.HOL. This translates to "Through concord little things grow - Holland". The reverse of the Proclamation Netherlands ducat depicts a Latin motto within a border. The Latin reads MO.ORD PROVIN FOEDER BELG.AD LEG.IMP. This translates to "Money of the Provinces of the Belgian Federation according to the law of the Empire". The Netherlands gold ducat can be a harder coin to add to your proclamation coin collection. In mint state they can cost upwards of $1,000 even for common dated coins. Also, because they were a true trade coin they are often found well worn or bent showing the hard life they had to lead. All that being said, they are not particularly scarce and honest mid grade examples (VF or EF) are quite affordable and obtainable. When looking for a Proclamation Ducat look for a coin with good original lustre, a straight flan, and a well struck up knight. It is not unusual to find these coins with a poorly struck knights head (it is virtually missing on some coins) and these should be avoided. In my previous entry about Australian proclamation coins I mentioned the Spanish Silver Dollar (or 8 reales) which was valued at 5s the proclamation. The 8 reales (or royals) coin of Spain and her colonies was probably the best known coin in the world at the time of Australian proclamation of 1800. Spanish milled dollars (also famously known as pieces of 8) were struck from 1732 until 1826. They are referred to as milled dollars because the planchets were made on a milling machine giving a uniform size and mass. Before 1732 8R coins were created by hammering the design onto irregularly shaped cobs cut from silver bars. From 1732 until 1773 Spanish Silver dollars were minted with the Spanish coat of arms on one side and the familiar Pillars of Hercules on the other, silver dollars from this period were known as 'pillar dollars'. From 1773 onward the coat of arms gave way to a portrait of the Spanish monarch, coins from this time were known as 'portrait dollars'. Spanish dollars were minted in several different mints, in several different countries, and with many different assayers initials on the pillar side of the coin. The number of varieties available is well beyond the scope of this article and has been the subject of many books. Minted from about 27 grams of 0.913 fine silver the Spanish silver dollar formed the basis of silver dollars from many different countries for almost the next 200 years. It was the model for the US silver dollar (the 8R was legal tender in the USA until the 1860's) with the silver content and size similar to US silver dollars minted until the 1930's. Other countries minted silver coins of a similar size and silver content as the Spanish 8R, these included Great Britain, China, Japan, Mexico, many different South American countries, and even France. When purchasing a Spanish silver dollar I think that originality of surfaces and genuine toning is paramount. Wear, while an important factor, is not critical. A nicely toned VF 8R is a lovely thing to behold and a lot more attractive than a dipped AU or UNC coin. That being said if you can find a toned uncirculated 8R at a reasonable cost I'd be jumping at the chance!. One thing to be aware of with silver dollars of Spain and her colonies is that some date / assayers / mint combinations are rare and can bring high prices from specialised 8R collectors. There is no need for an Australian Proclamation coin collector to hunt down these rare combinations, a representative commonly available sample of a Pillar and Portrait dollar should be all that is required for their collection. Q & A : Proclamation of 19th November 1800, when was it repealed? Hi, just wondered if you could clarify some things re Governor King's Proclamation of 1800. Firstly I'd suggest looking for a copy of "Foundations of the Australian Monetary System 1788-1851" (Sydney University Press) by S.J. Butlin as this seems to be one of the best sources for information on colonial currency. Sorry I am no expert on the field and will do my best to answer the questions you've asked, but please take them with caution, they are based only on my knowledge and research. Given that Tasmania was not settled by Europeans until 1803, the General Order (the proclamation of Governor King) of 1800 didn't explicitly cover Tasmania. Tasmania was under the control of the colony of NSW until 1825 so you could argue that the order did cover Tasmania. This is backed up by a proclamation made by Bligh in 1807 that prohibited the use of 'currency' (promissory notes). Part of this proclamation said 'the value of coins established is still in full force' which of course covered the valuation imposed by Governor King. Bligh extended this proclamation to Tasmania in 1809 so King's proclamation was indeed in effect there. 2. when was this Proclamation repealed - was it 15th August 1829 and again was it only for NSW. I don't know when (or even if it was) specifically repealed. However 15 August 1829 was the day that it was ordered in the Colony of NSW that no foreign coin should be accepted for official payments. 10 days or so earlier it was announced in the Sydney Gazette that fines to the Government could only be paid in sterling currency. The reason for the announcement was that 55,000 pounds of currency arrived in the colony and another 20,000 was due the next month so the need for foreign curreny was over. It was also announced at the same time that the call up of holey dollars would cease at the end of September. Apparently this was only for NSW (I am not sure what happened in Tasmania). The reason being is that the Tasmanian colony separated from NSW at almost the same time that the Spanish dollar standard was being abandoned in NSW and the two colonies adopted the sterling standard by different means. Well that's the beauty of coin collecting, if you can find a separate proclamation for Tasmania (and I am not aware of one) then by all means you can have subsets of proclamation coins. Personally I don't stick to the strict letter of Kings proclamation. The 1799 half penny and farthing circulated much more heavily than the silver and gold coins of King's proclamation so I personally think they need to be in any proclamation collection. The fines for removing coins and inflated values failed to keep silver and gold in the colony, copper stayed though, it just wasn't worth while taking it out and exporting it to England! Spanish dollars were in the proclamation though. If you're talking about other coins (like the Brazilian 960 Reis, or overstruck 2 rupees or similar) then probably not. It would be fair to say that any sort of widely used trade coinage of the time would have been seen here though, such as 8R fractions, ?? rupees, or 3 guilders or ducatoons. These traded through Asia and it's reasonable to assume they got here too. So if they interest you then I dont see why they couldn't form part of an Australian colonial coin collection. 5. Is there or should there be a definitive list of Proclamation coins which specifies the coin, obverse and reverse designs, mint marks, assayers mark and date range. Not that I am aware of. Just King's original document. Any 'definitive' list made up by academics is open to challenge and opinion. If you know of a list and you are happy with the evidence and support behind it then by all means use that. Personally I don't collect coins that way, I collect them because they interest me and for the history behind them rather than the academic interest they hold. Andrew Crellin, owner of Sterling and Currency Coins and author of a well known (and very pretty) book on Australian proclamation coins has an interesting article on What is a Proclamation Coin. It's well worth the read and urges collectors to think outside of the 10 coins covered by Governor King. Any help in these areas would be greatly appreciated by myself and I think by many others as many claims are made about a coin being a proclamation coin without any substantive or definitive evidence. You're more than welcome, it's been interesting doing some reading to find some answers to your questions! In my previous entry about Australian proclamation coins I mentioned the silver rupee of India valued at 2s 6d in the proclamation by Governor King of the Colony of New South Wales. Exactly what silver rupee Governor King was talking about in the Proclamation is unclear, as silver rupees were being struck in nearly 30 different Indian provinces at the time. Rupees could be crudely struck examples like that shown above, or more modern looking examples struck in a milled coining press. The rupee was introduced to India in the 16th Century and was supposed to contain 175 grains (or 11.33g) of silver. By the time of the proclamation the silver rupee being struck by the British East India Company comprised 180 grains (11.66g) of 88.8% fine silver. The EIC rupees (struck from 1773) are the most commonly accepted 'proclamation rupees' and were minted in the style of the Mughal Empire rupees. These EIC rupees were known as 'sicca' rupees, where 'sicca' translates loosely to 'widely and commonly accepted'. An example of one of these rupees is show above. The obverse of these coins has the Arabic inscription "Emperor Shah Alam, defender of Mohammed's faith, shadow of grace of Allah, has struck this coin to be current in the seven climes". Typically much of this legend does not fit onto the flan of the coin and is missing. The reverse of the EIC sicca rupees did not vary regardless of where the coin was struck. The Arabic inscription reads "Minted at Murshidabad the 19th year of the auspicious accession". The mint name did not vary despite some coins being minted in Dacca and Calcutta. The reason for the unaltering reverse was to prevent money changers and merchants in the capital city of Murshidabad discounting the value of rupees minted elsewhere. Because of the sheer range of silver rupees being struck in India at the time of the Proclamation it is hard for the collector to know where to begin. I'd suggest looking for a non milled coin of the late 18th Century as these would have been the most common rupees at the time. If you can pin a coin down as being minted by the British East India Company then you've got the coin most likely to have been traded in the Colony of New South Wales at the time. It is easy to imagine that currency from the British Colonies of India made its way to the colonies in Australia on merchant ships at the time. When looking for a coin I'd try to find one with the year showing on the reverse, the year is shown in Arabic script so you'll need to learn a few Arabic numerals to be able to spot it. Look for something well centered and without cracks or adjustment marks. You should be looking for a high grade coin with a natural patina (that is not cleaned or dipped). Silver rupees are common and there's no real reason for settling for a lower grade example unless the eye appeal is very high. In my previous entry about Australian proclamation coins I mentioned the Silver Guilder (or Gulden) of the Netherlands which was valued at 2s in the proclamation. A large 30millimetre coin minted from about 10.5grams of 0.911 fine silver you can see an example of the 1794 proclamation guilder above. Silver guilders were minted from the late 17th century to the early 19th century in most of the provinces of what would be come the united nation of the Netherlands in 1815. Interestingly one year after the coin above was minted the provinces were united (under French influence) as the Batavian Republic. It was not until 1815 that the rightful heir to the Dutch throne returned from exile (when the Napolean was deposed) to found the Kingdom of the Netherlands. The obverse depicts the robed godess Athena (the godess of Wisdom and the protector of Athens) with her left arm resting on a large book atop a pillar. In her left hand she holds an upturned spear. The date is shown in the exergue. The legend reads "HAC NITIMVR HANC TVEMVR". This loosely translates to "We Protect (or Defend) the one and are supported (or protected) by the other". In this case the one is the helmet and spear of Athena and the other is the book on the pedestal, which is presumed to be the Christian Bible. The reverse depicts a shield with a crown, in the middle of the shield is a lion holding 7 arrows. The 7 arrows represent the 7 provinces of the Netherlands. The denomination of the coin is shown either side of the shield. The legend reads "MO:ARG:ORD:FED:BELG:HOLL". The legend varies a little between coins from different provinces, for example, the HOLL on this coin signifies it was minted in the province of Holland. The rest of the legend can be translated as "Silver Coin of the United Netherlands of Holland". The Netherlands Silver Guilders are an interesting coin buy because there's a wider range of varieties available to the collector. I've purchased 4 of them and they've all varied in condition widely. The first couple showed good detail but had clearly been either dipped or polished and were not of much interest to me. The second couple were much more original showing darker toning and still having good detail. The coin shown above it quite dark and shows wear only on the highest points and considerable strike weakness through the lion on the reverse. In spite of this the above coin is the ideal coin for the collector, it shows original surfaces, lovely toning, and is an appealing example of the type. In my previous entry about Australian proclamation coins I mentioned the 1787 Shilling of Great Britain which was valued at 1s 1d in the proclamation. The brother coin to the 1787 Shilling, the 1787 Sixpence, while not mentioned explicitly in the proclamation was almost certainly traded at the same time for 6d 1/2d. Designed by Luis Pingo and minted from about 3 grams of sterling silver and 21 millimetres in diameter you can see an example of the 1787 proclamation sixpence above. Silver coins were only minted occasionally under George III in the 18th century and 1787 saw the largest mintage of shillings and sixpences until 1816 and the great re-coinage. The obverse depicts the older laureate bust of George III. The 1787 6d was minted with a single obverse. The reverse depicts cruciform shields with coats of arms and cruciform crowns. The reverse came in two varieties, with or without the semee of hearts in the Hannoverian coat of arms. At the top of this post you can see the with hearts variety of this coin, and above you can see the no hearts variety. The Hannoverian arms are at the 9pm position in the images. I would use the same principles when purchasing one of these coins as I suggested with the proclamation shilling. Generally originality of surfaces is the key to eye appeal with these coins. A blast white coin is a sign of dipping and I personally would avoid a coin like this. The images above show two examples of coins with very different surfaces. The top coin is a mint state example with probably an old cleaning that is starting to re-tone with a nice golden glow to the coin. The second coin looks to have much more original surfaces, it is a VF example but the violet/steel toning it has make it a more attractive example that the first coin. In my previous entry about Australian proclamation coins I mentioned the 1797 cartwheel penny of Great Britain which was valued at 2d in the proclamation. These large (36 millimetre diameter) copper coins were struck in copper in the years 1797 to 1799. Their large distinctive raised rims were reminiscent of cartwheels and they were nicknamed accordingly. The cartwheel penny and twopence were the first coins minted anywhere in the world using steam powered coin presses, and this new technology allowed the mass production of a well struck yet very large coin. The coins themselves weighed exactly 1 ounce (avoirdupois) or 28.35g. This was intentional and allowed the coins (and their 2 penny brethren which weighed 2 oz) to be used as weights for scales. The coins were minted at the Soho mint (the mint mark is visible on the reverse) in Birmingham. The mint itself was setup by Matthew Boulton, the well known 18th factory owner and manufacturer. His mint used steam powered coin presses, with the steam engines designed and manufactured with his business partner and steam engine pioneer James Watt. The obverse of the coin depicts a laureate bust of King George III facing right. The unusual incuse legend in the cartwheel rim reads Georgius III D.G. REX. This translates to George III, by the grace of God, King. The reverse of the coin depicts robed and seated Britannia facing left holding a trident. She is depicted on a back drop of the ocean with a ship at the bottom left, this symbolized Britains naval might and reliance on sea trade at the time of the striking of the coins. The mint mark SOHO can be seen in small incuse letters just below the figure of Britannia in the exergue. The incuse legend in the rims reads Britannia 1797. A key problem with purchasing these coins is the sheer size and weight of the coin. This can lead to significant rim bruising that (if possible) should be avoided when purchasing a coin. That being said attractive mid grade coins are readily available at reasonable cost. Higher grade coins (extremely fine and above) are obtainable if you are willing to wait for a coin to appear. Interestingly proof specimens of the cartwheel penny are available in straight copper, gilded, and bronzed copper. These are stunningly attractive coins but priced accordingly! In my previous entry about Australian proclamation coins I mentioned the gold pagoda of India which was valued at 8s in the proclamation. These small gold coins were a standard gold coin in southern India from the late 16th century. India, at the time, comprised a number of separate kingdoms, some of which were self governing and others which were ruled by the British, French, and the Dutch. The gold pagoda coins were, in fact, minted by the colonial powers in India rather than by the India itself. It is commonly accepted that the gold pagoda mentioned in the proclamation was that minted by the British East India company from 1740 to 1807 as the British link ensured that the coins found their way to many of the English colonies. The gold pagodas were minted using the ancient hammering technique. Basically small discs or blobs of gold of the correct mass were placed on a reverse die, and the obverse die (the so called hammer die) hammered into the blank coin producing the design. This results in an iregularly shaped coin that can often be weakly struck and the flan can show cracks along the edge. There were two types of gold pagoda coins struck by the East India company. The more commonly found single figure 'star' pagoda is about 11 millimetres in diameter and contained 3.41 grams of 82.3% pure gold. The less common 3 figure pagoda is slightly larger at 12-14 millimetres but contains almost the same amount of gold. The obverse design of the gold pagoda coins were inspired by coins from the Vijayanagar Empire which ruled southern India before the English. The single figure star pagoda depicts the Indian god, Lord Vishnu. The three figure pagoda depicts the same Indian god, Lord Vishnu flanked by his consorts Sridevi and Budevi. The designs themselves are crude and suited to the manufacturing method of the coin. Both the single figure star pagoda and the three figure pagoda display a granulated or beaded reverse. However, the 'star' pagoda includes a five pointed star giving this coin it's name. When looking to purchase a gold pagoda I would look for the best coin affordable with eye appeal. The hammered manufacturing technique means that flan cracks are common so I'd look for a coin with minimal or non distracting cracks. As to whether you should obtain a star pagoda or the three figure coin I'd probably suggest the star pagoda. These are the coins pictured in the Australian coin catalogue 'McDonalds' and were probably more commonly available. However, the three figure pagodas are larger and have more design elements and I find them more attractive. Of course, finances permitting, I'd probably suggest getting both varieties! In 1800, the Governor of the Colony of New South Wales issued a proclamation fixing the values of certain circulating coinage. This was known as the 'Proclamation' and it was done in an effort to retain coinage in the fledgling colony and stop it being removed by traders. When you think about the young colony of New South Wales in 1800, it would have produced very little in the way of manufactured goods, so the vast majority of these would have been brought into the colony by ship borne traders, who upon selling their goods for hard currency would have left taking the currency with them. This of course led to constant shortages in circulating coinage. To try to combat this Governor King proclaimed that certain circulating coinage would have a value above the actual intrinsic or circulating value of the coin itself. So for example, the 1787 Great Britain Shilling was proclaimed to have a value of 1 shilling and 1 pence. Of course, with a higher accepted value the coinage was much more likely to stay within the colony than to be removed by traders, and in addition extra currency was likely to be spent in the colony by traders because of it's extra buying power. Portugal, Gold Half Johanna, 2?? Values shown are in pounds, shillings, and pence. So for example, the Netherlands Gold Ducat was proclaimed to be worth 9 shillings and sixpence. In coming entries I'll take a look at some of the proclamation coins and also some of the other coinage that would have circulated within the colonies of Australia in the early 19th century (so called 'colonial' coinage).